Home Infographics Trending How Well is Your Wellness Program? As more insurers incorporate fitness and wellness programs into senior health insurance plans, there are several factors to address internally to ensure that these plans run smoothly. With complex plan payment structures and arrangements involving multiple parties, it can be overwhelming for an insurer to assess new strategies while they are trying to promote a new program and ensure its success. This is why Source One serves to assist health insurers in managing their Wellness Programs and driving the most value to members. In realigning structures and tightening controls, Source One works with wellness program providers to reduce costs of healthcare plans, optimize partnerships for a strong, sustainable future, and increase membership levels. Based on a changing healthcare environment, no insurer is the same; however, Source One is able to assess the current landscape to achieve efficiency and profitability in essential areas for wellness program providers. 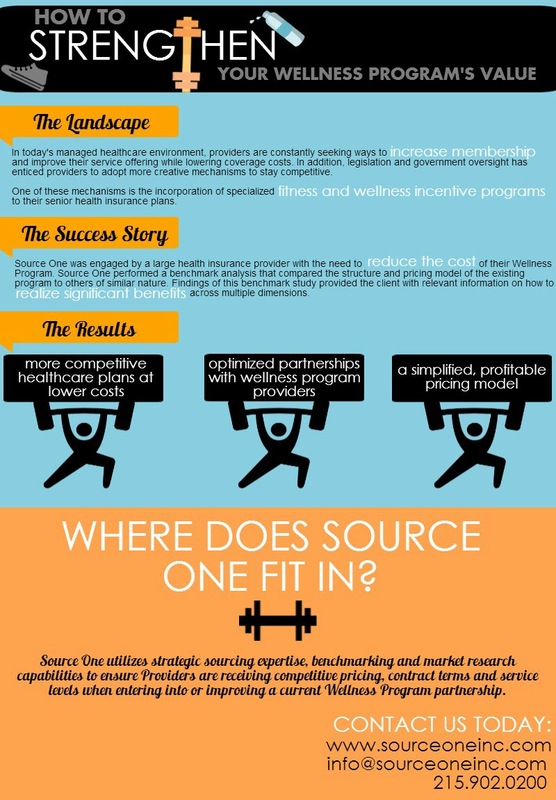 Learn more about how to strengthen your wellness program’s value in the below Source One infographic.